The Wade-Giles romanization system for Mandarin Chinese is the product of two British scholars: Sir Thomas Wade (August 25, 1818 - July 31, 1895) and Herbert Allen Giles (December 8, 1845 - February 13, 1935). 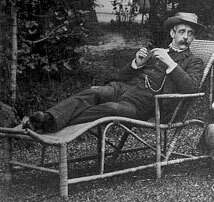 Giles served as a British consular official in various parts of China from 1867-92. He was first posted to in Taiwan 1867. He also served as British Consul at Tamsui (Tanshui/Danshui) from 1885-87. Giles, who succeeded Wade as professor of Chinese at Cambridge, revised the romanization system Wade had developed. The resulting effort became the de facto standard for the romanization of Mandarin Chinese for the majority of the twentieth century. Although the system is linguistically sound, it has proved largely ineffective in popular use. The system has largely been supplanted by Hanyu Pinyin.